For my first five years of elementary school, I went to school about two miles from my grandparent’s home at the same school where my mother also taught. Often in the afternoon on the way home from school, we would stop by their home to chat, visit, pick something up, or drop something off. The first names that I used to call my maternal grandparents were, “Ma,” and, “Dada.” However, around the age of 9 or 10, I grew self-conscious of those names because to my ears they sounded like baby talk compared to the other names kids called their grandparents. I started using, “Grandma,” and, “Grandpa.” In retrospect, my self-consciousness probably stemmed from reading so many books where grandparents had bland grandparent names. It’s funny what kids do. 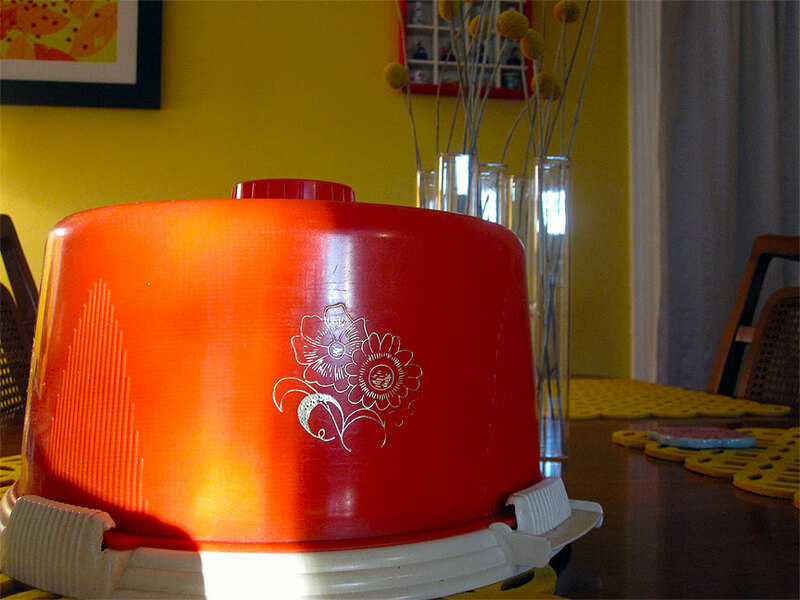 The biggest treasure hunt score was always when I noticed Grandma’s orange cake carrier out on the counter. Cake! Usually, I would excitedly open the carrier to find pound cake; always awesome, but not the ultimate prize. The best days were the days when the big reveal exposed Grandma’s Sticky Chocolate Cake (if you click the link, it will take you to the recipe for this amazing treat). I was in heaven with a can of Diet Coke (or Tab before that) and a huge paper plate of chocolate cake. Many years later after my grandmother died, when my Mom and Aunts were cleaning my grandparent’s house, my Mom asked me if there was anything from Grandma’s that I wanted. The only I could think of was Grandma’s orange cake carrier. It now has a treasured place on our dining room hutch, though I wish I baked a lot more, so I could leave it on the counter with cake inside. Maybe if Rob and I have children one day, I will be able to share with them the anticipation of seeing the orange cake carrier on the counter and slowly lifting the top to reveal their heart’s desire. My grandma’s cake carrier was a “LookLift” Cake Carrier. From time to time, one can still be found on etsy or eBay (like the examples above). Suz, I LOVE this story. So sweet. My mom thought SO MUCH of your grandparents!! !